1. In a high speed blender, blend cashews with water then add ice and blend for smooth, thick, creamy consistency. Add more water if needed to cream the cashews. 2. Add rest of ingredients except the fruit. 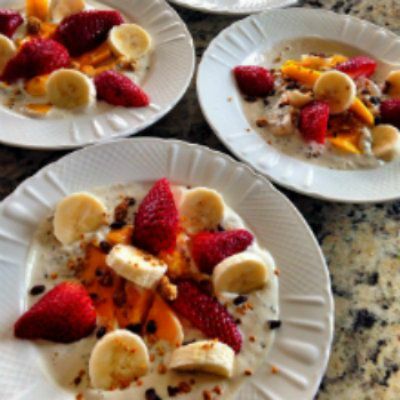 Pour cashew cream on over your bowl of fruits and berries. 3. Garnish with any of the superfoods below and enjoy! You can garnish with superfoods like dried mulberries, bee pollen, chia seeds and raw cacao nibs. Keep cashew cream in an airtight container in the fridge. Lasts for 2-3 days in the fridge.